I filled out my state income taxes online Monday. It was rather interesting. Next to the "Name" at the top of the form is a box titled, "Deceased", in case you have died during the previous year. The interesting part came when I was filling out my husband's name and then my name.... my cursor kept popping into "Deceased" only on my name! That afternoon I took the bus to run errands. I was dropped off a few blocks from the Library. Walking from the stop to my destination I passed a sign shop. They had some cute signs in the window they had made. I didn't stop and stare, but I did notice. Then, after the slightest glance, my eyes caught sight of the strangest thing sitting in the middle of the sign shop: a headstone.... with MY last name on it!!!!!!!!!!!!!! I had a good hearty laugh when I recounted the day to my husband that night, but both of us were a bit shaken as well. Am I going to die??!! Was this a message from God to prepare us? I do have a health issue that has left us not a little concerned at times... but... ? Yes, it was a message. But not the kind that made us anxious at first. God began to put on my heart the Ultimate message and this morning even my husband made a comment to that effect. The Greatest of Fridays happens this week. Jesus knew what was coming for him. He warned His followers, He prepared the disciples, He prayed and prepared Himself. Yet still, no one could hardly believe it when it happened. Every year, as Good Friday approaches, I ponder those last days of our Savior. I could never comprehend how He felt, though I could guess what his followers were going through. I lost my mother unexpectedly 8 years ago. One minute she was sharing motherly advice and the next minute... nothing. What if she or I had known she was about to die. What would our words have been? In John 17, Jesus spends time praying for and with his disciples before he is arrested. It is such a beautiful thing to see His heart poured out for these men and women he loved so much. I think, if I knew I were about to take my last breath, I would want to gather my family around and pray for and with them as well. I would want to die with them in my heart and I in theirs. I would hope to encourage them to live well and shine God's light through whatever they faced... even if I couldn't be at hand. 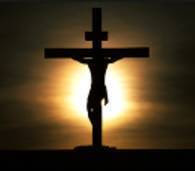 As I look up at the cross with Good Friday approaching, that is what I see. My savior, broken and bleeding, with my name written on his heart and His on mine. I don't know when my time will come but I know where I am going when it does.... and it is all because of a man, some nails, a hunk of wood and a love that ran more deep then anyone can fathom. Jesus gave His life for you, will you give your life to Him? May you rest well this week knowing your name was on His heart, and realize that His name is on yours! What a strange experience! Praise God our lives are in his hands and that he is in control of all things. Whatever it was, you were drawn to the cross where all our answers are found. Thank you for sharing and have a blessed Easter. Thank you! A blessed Easter to you as well!